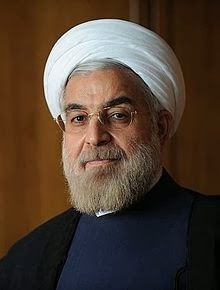 Who is Hassan Fereydoon Rouhani? What is his resume like? He was born on November 12, 1948 in Sorkheh, Iran to a religious Shi'ite Muslim family, so he will soon have his 65th birthday. 3. Was one of "moderates" in 1986 that Robert McFarlane dealt with in the arms-for-hostage meeting in Tehran. McFarlane was President Ronald Reagan's former national security adviser who met with them in a secret trip.The Iran-Contra affair involved secretly selling arms to Iran and funneling the money to support the Contras in Nicaragua. How is he different from the previous President Ahmadinejad? He's using a "charm offensive" approach. Prime Minister Benjamin Netanyahu believes this is ploy meant only to stave off Western action against Tehran's nuclear program. Through Ahmadinejad, we learned that Iran's feeling was that Israel needed to "vanish from the page of time," accompanied with vows that no one could stop the Islamic Republic if it wanted a nuclear weapon. Iran even claimed that a "nefarious cabal inside the US government was behind the 9/11 attacks on New York and Washington. Ahmadinejad's favorite site to spew lies about Israel was the UN General Assembly in New York and did this every year since 2005 until last year. Rouhani is taking a defensive approach. Israel is alarmed at the prospect of a meeting between Obama and Rouhani. Netanyahu feels that a "bad agreement is worse than no agreement at all. Ahmadinejad spent all his time of showing an overt anti-Semitism affect. Everything he said about Jews was more than anti-Semitic, if that were possible. He often said that "Israel will be eliminated." He accused Jews of having no roots in the Middle East. Evidently he hasn't heard our history as told in Queen Esther's story which is found in the Bible, either, when a Jewish woman was queen of Persia. This is what made him so loathed. Rouhani is moving in a different direction to get the same goal. He knows his country's nuclear program is seen as a direct threat to Israel and that Israel's officials are highly skeptical of a diplomatic solution to this standoff. He's trying to assure Israel and the USA that he is not a threat. His comments come hard for him and he has raised concerns among skeptics who worry that he may not be all he seems. Steps of his to reach out to the Jews have been symbolic and awkward. On September 4th he sent out a Twitter account wishing "all Jews" a happy Rosh Hashanah. The West could not believe their eyes. Was it actually from Rouhani himself? They concluded, Yes, but not directly from him. The Iranian foreign minister sent Rosh Hashanah wishes as well. Last week he was interviewed by Ann Curry who had previously interviewed Ahmadinejad for NBC. She was way too easy on Ahmadinejad and soon after that had lost her position. This time she asked Rouhani point-blank if he shared Ahmadinejad's view about the Holocaust being just a myth. Rouhani dodged that bullet and said, "I'm not a historian. I'm a politician. What is important for us is that the people, the nations in our region should get closer to one another." Well, the leaders could all sit around a campfire and sing, Kum Bay yah, my dear, Kum Bay yah, but I don't think he meant that way in closeness. Notice how he said it wasn't important about what one thought about the Holocaust being a fact? He's minimizing the importance of saying he also doesn't believe it happened. He just wants to be the leader of the pack and to be seen as the good guy. .
Rouhani's UNGA speech didn't include Israel or even Jews. CNN's interview was reported with Rouhani telling them that he condemned the Holocaust as a horrible crime against humanity which of course Ahmadinejad was the strong Holocaust denier. Since that interview was aired, Tehran officials have challenged the translation of Rouhani's remarks. Suddenly President Hassan Rouhani let Obama know that he wanted to talk on Friday. Iranian officials contacted Americans and Obama about it. Obama returned the call at about 2:30 p.m. and they spoke through a translator for 15 minutes even though Rouhani is fluent in English. This first is an event of more than 30 years since Iran and the USA presidents spoke. That way Rouhani can always blame the translator if it isn't acceptable as told to newspapers. Obama was concerned about 3 Americans; former FBI agent Robert Levinson who had disappeared in 2007 from an Iranian island, Amir Hekmati, a former Iranian-American Marine they are holding on espionage charges, and Saeed Abedini, Iranian-American Christian in prison for 8 years for evangelizing. After the call, Obama called Israel to let them know because such a private phone call connection would be viewed with possible alarm considering the alarm Israel is already under about Iran. The newspaper reporters added that "both are likely to encounter fierce resistance from domestic opponents and close allies, especially Israel in the case of the United States." After all, Israel is greatly concerned about saving the lives of 8 million Israelis and does not want an atom bomb dropped on their tiny country. Rouhani told people on his Twitter feed and let people know that they discussed "different issues." One included the need "for expediting a resolution of the West's standoff with Iran over the latter's nuclear program." The sweet talk will now continue to get those nasty sanctions lifted. And what changes will we see from Iran? It reminds me of the alcoholic who continues to tell his wife that he's sorry and will not drink anymore. Usually they are so convincing. Does Rouhani continue with Ahmadinejad's denial that it is seeking nuclear arms and says its atomic work is peaceful and aimed at generating electricity? In an oil rich country? Come to think of it, isn't this ploy exactly like our bad cop-good cop routine? breakingisraelnews.com Israeli Minister Calls Palestinian President's UN Speech a "Lie"
Did Rouhana say "Holocaust"? But despite much attention given to the issue, including two editorials in the Wall Street Journal, a challenge in Newsweek’s The Daily Beast, and a more accurate translation in Al Monitor, Amanpour has stood by the accuracy of CNN’s translation (which apparently came from a translator hired by the Iranian government), and has refused to issue any corrections.